Every day now brings us closer to Halloween and Thanksgiving, which means one thing: summer isn’t coming back any time soon. Fall not only brings crispy air and crunchy leaves on the ground, but also a higher risk of getting sick. Exposure to cold temperatures can cause serious health problems. Infants and the elderly are particularly at risk, but anyone can be affected. As roofers across the country are preparing to put their tools away and take some well-deserved rest till the next season, we put together a list of tips to help you get through fall and winter unscathed. 1. Don’t lock yourself up inside. Yes, some days are colder than others, but generally moderate temperature of Chicago fall and even early winter is a reprieve from the sweltering summer and a gift before the frigid winter. What better season to put on a sweater and head outside? Plus, spending time outdoors increases your vitamin D levels, makes you happier and improves your concentration, according to Harvard Medical School. 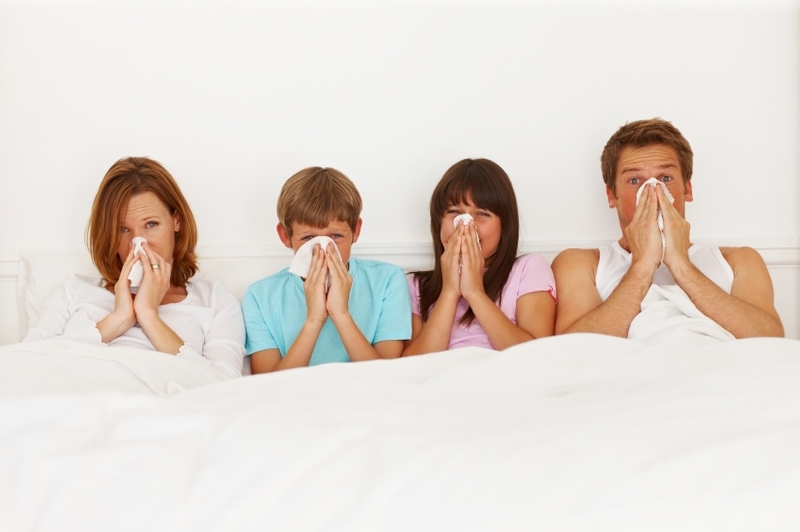 Staying cooped up inside can actually increase your chances of getting sick, especially if your indoor air quality isn’t great. Colder weather doesn’t mean that you have to stop being active (although it does take some extra effort for us, Chicagoans). Take in the changing scenery on a run, hike or bike ride. Join an intramural fall sport, such as flag football, soccer or Ultimate Frisbee. Don’t feel like trying anything new? Simply get a little more serious about your chores. For a 150-pound person, 30 minutes of raking leaves, 30 minutes of playing with the little ones each burn roughly 150 calories. Once there’s some snow on the ground, get ready to start shoveling. 1 hour of shoveling can burn about 413 calories! Take advantage of vegetables, especially fall staples like pumpkin. The pulp of this fall favorite is dense with vitamins A and C, and its tasty seeds, called pepitas, are rich in phytosterols, which may help to lower cholesterol. With all the health benefits of pumpkins, don’t they deserve to be more than a craft project that rots a few weeks later? Not to mention cabbage, carrots, cauliflower, eggplant, kale and squash. An abundance of tasty autumn vegetables makes it easy to reap the benefits of a plant-based diet, such as diabetes prevention, hypertension control, heart health and more. 90-degree weather is a distant memory, but colder weather doesn’t mean that you should drink less water. Hydrate with tons of water throughout the day, and your immune system will thank you. The foods you eat can also help prevent the cold. Yogurt, with all its probiotic glory, has been shown toboost the immune system, and one serving of seaweed packs more vitamin C than an orange. Another immunity booster? Did we mention pumpkin? 5. Don’t drink and drive. Drinking and driving is never a good idea, but with shorter days and more hazardous road conditions drinking and driving is a deadly gamble. Alcohol use impairs skills needed to drive a car safely. It slows reaction time and impairs judgment and coordination. Alcohol-related motor vehicle crashes kill someone every 48 minutes. Don’t drink and drive, and don’t let others drink and drive. Don’t forget what you Mom has taught you. Keeping hands clean is one of the most important steps you can take to avoid getting sick and spreading germs to others. It’s best to wash your hands with soap and clean running water for 20 seconds. If that’s not possible, use alcohol-based hand rubs. Sources: Center of Disease Control and WebMD.